The Public Art Pollinator Project is a collaborative revitalization initiative to raise awareness of the plight of wild pollinators, empower communities to actively engage in solutions for habitat loss, and transform under-utilized urban sites into aesthetically pleasing and environmentally sustainable spaces that serve as pollinator pastures as well as public spaces. The project is sited in the cities of Richmond and Kelowna and managed through Emily Carr University and the City of Richmond; and UBC Okanagan and the City of Kelowna. 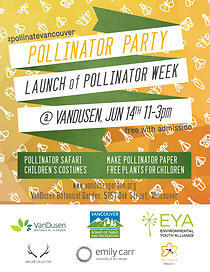 As part of Emily Carr's ongoing work with native pollinators, Dr. Cameron Cartiere's chART research group will be working at the Pollinator Party, to support the launch of Pollinator Week, June 15 - 21, 2015. Student researchers will be on hand making seed paper that will eventually become 10,000 laser cut bumble bees, which will be installed in an exhibition at the Richmond Art Gallery this coming September. Stay tuned!